On Second Scoop: Ice Cream Reviews: Oh yeah! A new month means a new blizzard! Oh yeah! A new month means a new blizzard! I love that there is a DQ that's easy to hit at lunchtime! 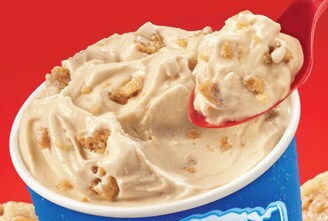 Forget my sandwich, it's a new month and that means it's blizzard time! Now I was pretty frightened when I heard Denny's has a new Maple Bacon Sundae, but now that DQ has come out with the new Maple Bacon Blizzard, I may become a convert. The new blizzard is brown sugar cinnamon crunch coated bacon bits blended with maple syrup and creamy vanilla softserve. Kudos to DQ for a truly unique blizzard, nice job! I'm going to have to give in and give it a try at lunch, wish me luck!! OH NO. Maple. I love maple. PLEASE post a review soon. Gasp. if this isn't an april fools joke then I want to know the nutritionals for a mini because I'd so try this. To buck the bacon trend, I defiantly bought prosciutto today. I look forward to the review! I don't usually do an april's fool joke, but I got inspired this morning. It's all about making you think about going to DQ and NOT thinking about what day it is. Stay tuned for the real review!